VIFF 2015—Greek director Yorgos Lanthimos' absurdist dystopian comedy, The Lobster, is a rather unconventional, surrealist love story to say the least. It's a bold, insightful satirical look at society's obsession with finding romantic love and coupling as it takes those themes to bizarre lengths. Colin Farrell plays a rather mild-mannered, recently single man looking for love in a hotel where if you don't find a mate within forty-five days, you turn into an animal of your choosing. Yes, in this reality, being single is illegal and once your relationship is dissolved, you must pair up almost immediately. These hotel interactions between him, Ben Whishaw, John C. Reilly, and the other house guests somewhat competing for matches are dryly hilarious. Farrell does some really fine, understated work as a mopey sad psack forced to look for love in all the wrong places. After eventually leaving the confindes of this love hotel, Farrell's David seeks refuge in the woods with Léa Seydoux's team of survivors and soon falls for Rachel Weisz (also the narrator) as the bond over their mutual shortsightedness. The idea of falling in love over shared attributes like limps, stutters, and nosebleeds is an amusing, reoccurring thread as Lanthimos comments on our tendencies to bond over shared experiences with others more like ourselves. What Lanthimos and co-writer Efthimis Filippou do so successfully is highlight the often frustrating perils of being single in a society of couples just as it exaggerates the hardships of being in seemingly conventional romantic relationships. It's a riot of a film and extremely weird as everything that happens outside the hotel is not only unexpected, but entirely surreal in both its darkly heartbreaking and comically beautiful qualities. 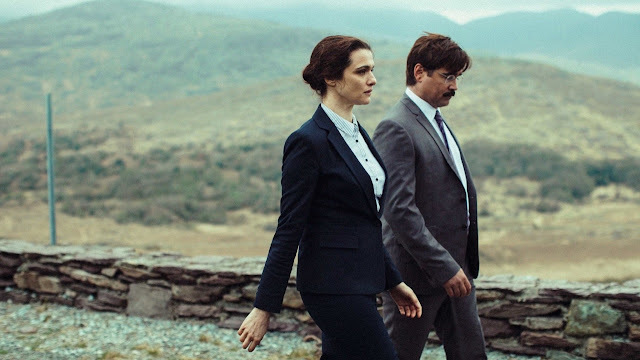 The Lobster, particularly the first half, is a dry romp as it earnestly explores the nature of modern romance in the most absurd and bizarre of circumstances. Farrell and Weisz are delightfully whimsical in very dark manner and set in a lightly dreary European setting. It's easily one of the more complex comedies in recent memory while masquerading as a light and quirky tale in dystopia. The Lobster is screening at the 2015 Vancouver International Film Festival as part of the Cinema of our Time series.